Bangladesh Heritage Foundation organized a national conference for discussing the situation arising out of the exodus of rohingyas form Myanmar to Bangladesh and discussed about the 5 point proposals of Prime Minister Sheikh Hasina MP at the UNGA on 21st September 2017. The conference Chaired by Mr. Waliur Rahman, Chairman of Bangladesh Heritage Foundation. High Commissioner of Canada, H.E Mr. Benoit Prefontaine, was Chief Guest in the conference. The special guests were Mr. Lieutenant General M. Harun – Ar- Rashid, Mr. Julian Francis,M.S Siddiqui, Mr. Sarwar Jahan Chowdhury , Prof. Farhad Hosain, Ambassador S.M. Rashed Ahmed , they all are presented their important opinion on this issue. 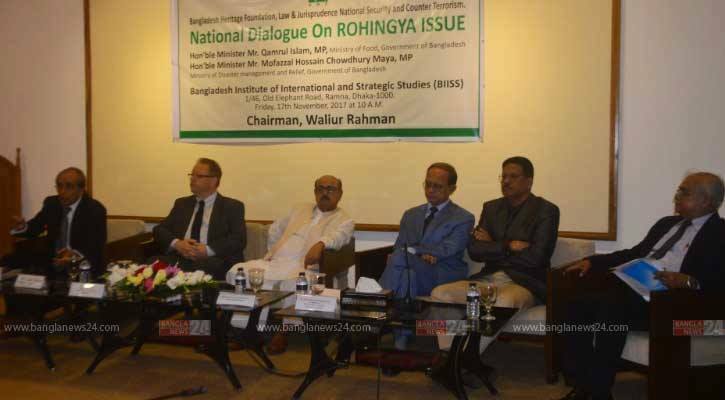 Mr. Waliur Rahman said Bangladeshis are welcoming the Rohingyas. They don’t want to throw them down. Many of them doesn’t live a life of luxury but still they have welcomed the poor people. They are poorer than us. Unlike others, they let them come. Europe for example, then Czechoslovakia. They crossed the border then nobody can come. So see, I’m not taking the name of one country but there are many countries in the world who are scared to take the refugees. See, refugee does not become a refugee for the sake of pleasure. I was a refugee in Geneva for 9 months! While the liberation war in Bangladesh, I resigned to the Pakistan government. It is not a pleasure. So, a refugee becomes a refugee not out of any high thought, high principal or any pleasure. No, but because of some compassions. It’s political or other compassions. Here Mr. Harun – Ar- Rashid presented a statistic chart about the overpopulation and he said that there is discontentment among the local people because they are becoming minority.